As the old saying goes, "Beauty is in the eye of the beholder." The same could be said about wedding favors. On one hand, your guests have dedicated their time and money to come celebrate you, and something that says "thank you" should be in order. But finding a creative way to do so is a challenge many couples find themselves facing during the wedding planning process. Give your guests a tangible and photographic reminder of the fun they had on your Big Day by providing a photo or GIF booth. It's a compact, easy gift (and an often wallet-friendly option for you) to leave your guests with. Bonus points: You can leave cutouts of your faces as props to add a more personal touch. After the endless dancing and celebration, what's better than a delicious, sweet/savory snack to top off the best night ever? You can think small like Krispy Kreme donuts, or something a little heartier like an In-N-Out burger. 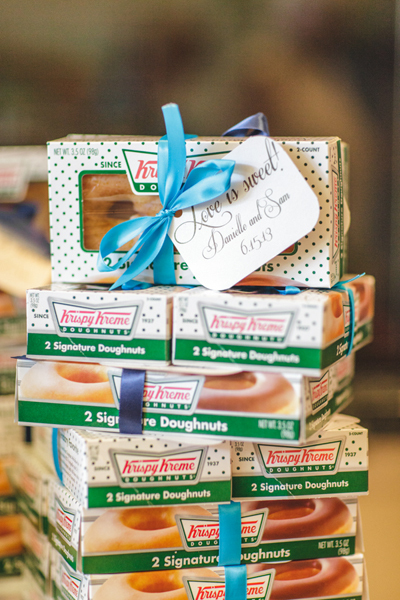 As we all know, a way to a wedding guest's heart is through his or her stomach. Giving back is an important thing for many of today's couples, and rather than spending money on providing physical wedding favors, you can take that investment to a non-profit or charity. That way, you can share the happiness and joy of your wedding day with people and organizations that need it most. Make your wedding more interactive for your guests by setting up a table with an array of to-go desserts. You can even share a symbolic treat on the menu. For example, if you and the groom-to-be went to a movie for your first date, include a snack that you enjoyed together and immerse your guests in a special moment from your love story. How will you say thank you to your guests? Share your favorite favors in the comments section below! already have an account or Sign Up to create an account. Harsanik is a perfect guide for all of your wedding planning needs! "Harsanik" is the Armenian word for wedding. Copyright 2007-2018 KMG SOLUTIONS, Inc. | Harsanik.com is a registered trademark of KMG SOLUTIONS, Inc.